I recently started experiencing issue with my wordpress website, I start receiving this webpage has a redirect loop. It did not matter what browser I was using, as that was the first thing I did clearing cache and cookies. That did not work so I started to power cycle my server, as I running my wordpress on a server from Digital Ocean. This worked for a while, only had occasional issues with redirect loop. Lately the redirect loop started to get more frequent, so I needed to to find a more permanent solution. I running a wordpress MultiSite installation, I have a MySql setup for replication and using the hyperdb plugin for taking advantage of the MySql replication so I can scale the site when needed. The problem started when I installed the hyperdb plugin, I had to tweak the configuration to make it work. I did not solve the redirect loop, so I had do some additional research into what could cause the problem and came up with an simple solution. I logged in as an administrator and went to the permalink settings, clicked on Custom Structure, clicked the Post Name common setting again, and then pushed the Save Changes button… and that resolved the This webpage has a redirect loop. The website was working normal again and the error no longer appeared on any internet browser including Google Chrome. Use the text below to easily fix the This webpage has a redirect loop on your WordPress website. If you would like to share additional solutions and tips please feel free to leave a comment below. Sign into a WordPress admin account for your website. 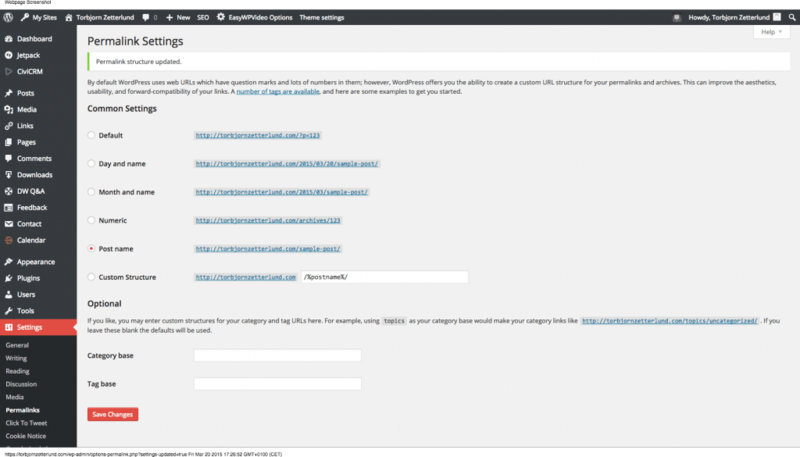 In the WordPress dashboard under the Settings tab on the left sidebar, select Permalinks. In the Common Settings briefly select a different setting for your permalink structure and then select your original permalink setting and click the Save Changes button at the bottom of the page. That takes care of the issue I had, hope this resolves any issues you have with redirect errors. If you find this entry useful please add a comment below.